Though she’s previously released two albums and an EP under her own name, Austin’s Charlie Faye has engaged in a radical makeover for her latest project. Gone are the alt-country trappings of those earlier discs, replaced by a sound that focuses squarely on sixties pop of the Stax and Brill Building varieties. Ably abetted by two excellent singers (BettySoo and Akina Adderley, the latter a scion of jazz royalty) and a superb group of musicians that includes Pete Thomas, Roger Manning (Jellyfish, Moog Cookbook) and Lyle Workman. Faye’s songs never fail to evoke the sound and aesthetic of classic girl-group and southern soul. 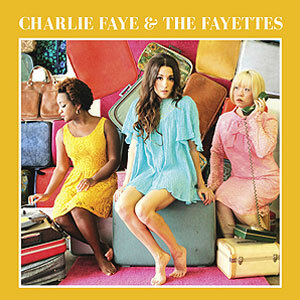 Yet somehow the album never feels like an overt pastiche; when they sing about giving a guy the go-ahead (“Green Light”) or love in general (”Sweet Little Messages”), Charlie Faye & the Fayettes sound like they mean it.